Set in 2028, one of the first things that may strike you about the future is the seeming longstanding embargo on the car manufacturing industry. In fact, we seem to be without any real advances whatsoever on the 2008 version of the Renault Clio, so my advice would be to take good care of yours should you have one. Okay, I am being slightly facetious, so pedantic quibbles aside, let’s get to the meat on the bone. 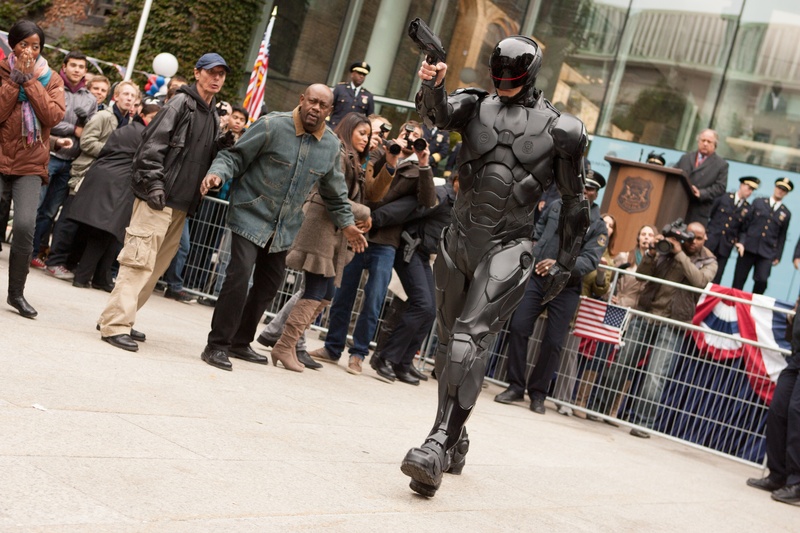 Is Robocop 2014 perfect? No. Are there some illogical, Swiss cheese-like, plot inconsistencies? Yes. However – and this is where we pick things up properly – I am pleased to say that this is a reboot of both style and substance. It aims high. What looked like a terrible idea on paper turns out to be a greater success in reality. The story goes that the US military have been using the robots and drones produced by the multinational conglomerate Omnicorp overseas for years. They have never used them at home. When good cop (and loving husband/father) Alex Murphy is critically injured in the line of duty, the powers that be seize an opportunity to sway the public’s opinion with the introduction of the first part-man, part-robot police officer. Underneath any smokescreen of frivolity (things getting blown up) there is a clear depth and intelligence operating under the film’s hood. Beating at its heart is the type of doctor/patient relationship that would have Mary Shelly groaning in her grave; man’s ambition and his desire for legacy is all sent colliding into the path of social, personal and political consequences. Michael Keaton may be devoid of any of his Beetlejuice tics but he still offers a vibrant screen presence. Abbie Cornish, meanwhile, is an adept cipher for the audience as the emotive cog at the centre of the piece. Joel Kinnaman steps into Peter Weller’s sizeable suit and passes credible muster. Gary Oldman is reliably wonderful. And Sam Jackson? Well, he is like the rabid love child of Jeremy Paxman and Piers Morgan. What’s not to love there? There will be naysayers who will hark on about the sacrilege of remaking this film. I was one of them. But open your mind to objectivity. The Robocop of 2014 is a rare blockbuster; one that offers brains, as well as bang, for your buck. This entry was posted on 07/02/2014 by toomuchnoiseblog in Reviews and tagged abbie cornish, action, Cinema, Film, gary oldman, Greg Wetherall, joel kinnaman, jose padilha, michael keaton, Release, robocop, samuel jackson.